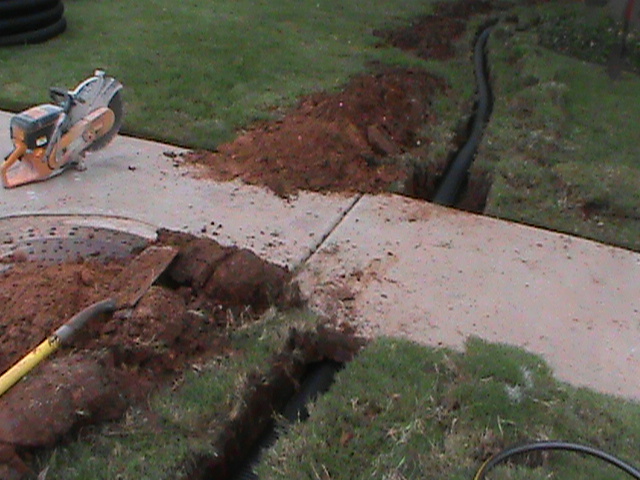 CMG has installed French Drains and Drainage Systems in Central Oklahoma for 21 years. Drainage Systems can be made up of one drain or a combination of many drains. Drainage problems can be very complex. Complex Drainage Problems may require a combination of several different types of drains all inter-connected and working together. Many times a French Drain, might be connected to a Surface Drain, which then could be connected to another French Drain. Other times the drainage problem may be simple and straight-forward requiring only one drain or several of the same type of drain connected together. An example of a complex drainage system would be: A French Drain in the back yard connected to a Surface Drain near a flower bed connected to several gutter downspouts, which are connected to a Channel Drain going across a driveway, which is connected to additional French Drain in the front yard, which runs to a Curb Fitting that lets all the water drain out on to the street. A simple Drainage System might consist of a French Drain which runs to a Pop-up Emitter which lets water drain over the curb and into the street. 1. Keep water away from foundations — A French Drain is best because it can move Surface Water and Sub-Surface Water (water moving under ground) away from the foundation. Many times less experienced companies install Surface Drains to keep water away from foundations. This can be a big mistake. A Surface Drain can’t move or drain Sub-Surface Water. Also A Surface Drain often can’t move enough water fast enough and easily becomes overwhelmed during a heavy rain. A Surface Drain also can’t cover or protect a broad enough area. Surface Drains should be designed in a Drainage System to be located in smaller Drainage Areas moving moderate amounts of water. Surface Drains look better than French Drains. If ,”appearance” is more important than Drainage Capacity, Go with the Surface Drain. Just know what you are getting into and what your expectations should be. One side of a foundation alone, can be over 100 feet. A 4 inch or 6 inch French Drain is best when protecting a large area such as a foundation. 2. Keep water away from small or inclosed areas. This might be a low area just through a gate on the side of a house, or the low area between a flowerbed and the wall of a house, or standing water on or near a sidewalk or driveway. These types of Drainage Problems are best served with Surface Drains. A Surface Drain can move water away from a low area that is relatively small. This can occur in yards, flowerbeds, sidewalks and driveways. A surface Drain is designed to move Surface Water away from a problem area to a predetermined exit point. Surface Drains are available in many sizes. How quickly they remove standing water is usually determined by the size of the pipe that is connected to the drain. Simply put, a Drainage System is one or a group of underground Drain Pipes that take water away from a place that has water standing on it or flowing across it. The water that is in the problem area, can be causing damage or may be inconvenient or both. (Usually Both) A simple Drainage System is a Drain for the water to enter, a Drain Pipe to move the water away from the Drain, and an Exit Point for the water to be released out of the Drain Pipe. How does the water get to the problem area? There may be one or many sources. There are other reasons for Drainage Problems, the above reasons are just the most common. Once the number of water sources is determined, a rough estimate of the amount of water that needs to be drained away on average must be estimated. This can be simplified down to “SMALL, MEDIUM, OR LARGE AMOUNTS OF WATER TO BE DRAINED AWAY. You don’t have to be an engineer trying to calculate fluid dynamics. Experience at diagnosing drainage problems helps however. How much water needs to be moved will help determine the type and size of the Surface Drain or French Drain that needs to be installed. It also helps to determine the size of Drain Pipe required for the Drainage System. A good rule to follow is, “If in doubt, install a larger Drain and Drain Pipe.” Unused Drainage Capacity is better than property damage caused by a Drain that is overwhelmed by too much water. The Drainage Curb Fitting is installed when the desired exit point for the French Drain will release the Drainage Water into the Street. 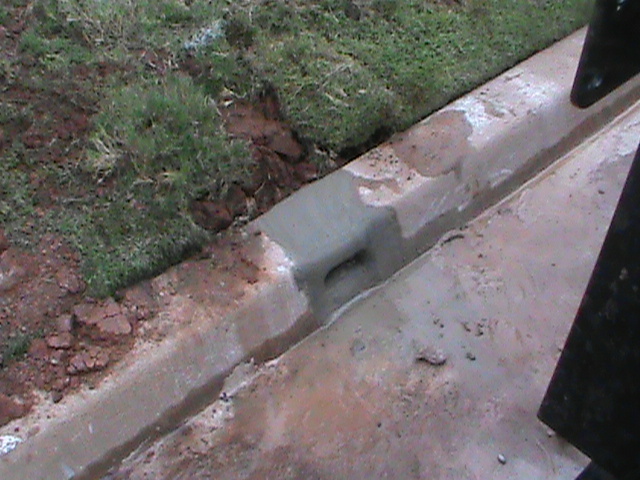 The Drainage Curb Fitting is rectangular in shape and made to be installed through the curb. A small section of Curb is cut out with a concrete saw. The Section is a few inches wider than the Drainage Curb Fitting. We then install new concrete around the curb fitting. Once the concrete has dried, the Drain Pipe coming from a French Drain or Surface Drain is connected to the Drainage Curb fitting and then covered with dirt. The Drainage Pop-Up Emitter is connected to the end of a Drain Pipe. It is downhill from a French Drain or a Surface Drain. It is a small release basin with a green pop-up lid. When releasing water, it pops up about an inch to release the water from the French Drain or Surface Drain. When the Storm Water has moved through the Drainage System and out of the Pop-Up Emitter, the green lid closes back to its original closed position. The emitter is designed to release water out into a yard or down a hill or other desirable Drainage Exit Point where there is no curb. Drainage System installation and design is a big part of our business. Does your sidewalk turn into a moat after a hard rain? Does part of your yard look like a pond after a thunderstorm? Worst of all, are you experiencing concrete deterioration to your foundation, sidewalk, or driveway. CMG can design a Drainage System to solve your Drainage Problems. Our Drainage Systems can be simple or complex. We utilize, French Drains, Surface Drains, Channel Drains, Basin Drains, Basement Drains, Trench Drains, and Sump Pumps. Estimates are free! use the phrase, “French Drain,” to apply to many different types of Drains that could be used in a Drainage System. Hard rain in Oklahoma is common. Many homes and businesses have drainage problems. Standing water from storm water run-off can cause damage to grass, trees and shrubs, not to mention foundations, sidewalks and driveways. CMG can design and install a drainage system that may be complex using several types of drains, or basic using just a French Drain or a Surface Drain. It depends on the customer’s needs. If you live in Central Oklahoma and need a French Drain to protect your home’s foundation, Give CMG a call. A French Drain is a great way to keep water away from cement such as a home foundation or driveway. When water is left standing near a driveway or sidewalk, it can cause deterioration and cracking. A French Drain is a Good way to keep water away from problem drainage areas. We also install Surface Drains of most types and sizes depending on our customer’s needs. CMG can schedule a free estimate for a drainage system. A French Drain can be an important part of a Drainage System. A Drainage System is one or several types of drains connected to an exit point, were the unwanted water is to be released. A French Drain may be connected to a Surface Drain which in turn may be connected to a gutter down-spout, or Channel Drain. All the different drains are connected under ground by drain pipe to a Pop-Up Emitter or a Curb fitting to release the water. What goes into a Drainage System depends on the individual Drainage Problem. Some Drainage Problems are Simple and need only one type of Drain Connected to an exit point. Other Drainage problems require a more complex solution. Either way, CMG can answer your questions and provide a Drainage Solution. CMG relies on 21 years of experience when solving Drainage Problems. We utilize French Drains, Surface Drains, Channel Drains, and Sump Pumps when designing a Drainage System. CMG provides free estimates for Drainage Systems for all of Central Oklahoma, including Oklahoma City, Moore, Norman, Edmond, Yukon, and all surrounding areas.